I am never a sports person and I have never thought of picking up running as my hobby. But running with friends can bring a whole different experience to me, and it motivates me to run a lot for the past 2 months to improve my mood and boost my stamina. For the upcoming PUMA Night Run, I am all set to run 10km (as a starting point for beginners like me). And the most headache part comes when picking my “perfect” pair of running shoes! In fact, there is no perfect pair of shoes on Earth but all you need is the “right” pair of shoes that best suits your feet, be it in terms of function, fit, design or comfort. And guess what I've found? 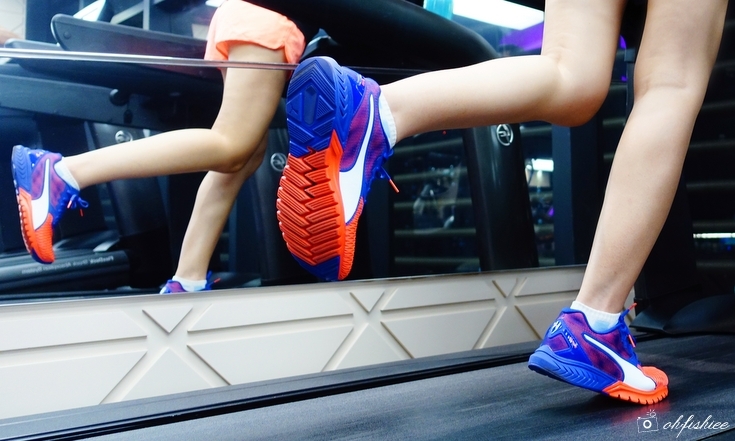 IGNITE Dual: PUMA’s most versatile, energy-returning running shoe to date. More energy. More flex. More comfort. My latest pair of running shoes is the PUMA Ignite Dual for Women, in Red-Blast Royal Blue color which is newly launched in early August 2016. What distinguishes this IGNITE Dual range from the rest of PUMA’s collection is the amazing Energy Return feature which literally “bounces” the energy to your feet and help make your faster. As much as it gives a comfortable feel, it plays a more important role in keeping my feet running strong. The full-length IGNITE Foam midsole gives exceptional cushioning, power and high energy returns. Mesh upper and deep forefoot flex grooves combine for optimal freedom of movement. and a more stable, stronger heel. IGNITE Foam provides step-in comfort and an extremely comfortable feel. Carbon rubber outsole at toe and heel makes each pair last longer. I have been wearing my pair of PUMA Ignite Dual to the gym for 2 weeks now. The overall feel is not bad, considering that it is a very responsive running shoe by providing high rebound, energy return and ultimate comfort especially for long-distance runs. With lowered mid-sole heights, articulated chevron design and flex grooves in the forefoot, it allows plenty of space for my toes to move around and “breathe” under the flexible and breathable mesh upper cover. Love the lightweight flexibility and an incredibly comfortable fit which it offers! Well, running on a treadmill and in a park give a total different experience. During my night run training, I realise I can better feel the responsiveness of the road in this shoes. The IGNITE Dual's superior cushioning material is important to disperse impact forces on the road. Design wise, the heel is secure in the lace closure which provides a snug fit whereas its bright, vibrant color is perfect in increasing visibility. I'm all ready for PUMA Night Run, how about you? What’s your ideal shoe? You’ll know it when you’ve found it! Whether you’re an avid marathoner or casual runner, happy feet can make all the differences. So don’t pick the wrong shoes! Hope to see you there in the upcoming run! 1. At RM429 per pair, I personally think it is a good buy considering the comfort, flexibility and energy return it offers. 2. The overall experience is great-- Flexible and supportive. Lightweight and powerful. 3. Rating: 4.5/5 ; If you are looking for a good pair of running shoes but do not have high budget, perhaps IGNITE Dual is something you can consider.